Anyway, season 2 kicks some conflicts into high gear. One of them involves work-related conflict, as embodied by Ari Gold (Jeremy Piven) and Terrance McQuewick (Malcolm McDowell), although major players in this conflict include the hobbit-like E (Kevin Connolly) and the adorable Lloyd (Rex Lee). Work and showbiz-related conflicts cover more or less the entire season. And of course, Johnny Drama (Kevin Dillon) and Turtle (Jerry Ferrara) provide the comic relief. One of the rare instances showing Turtle without any headgear. Also, what’s work without love? In the words of Johnny Drama, “The on-set romance is a time-honored Hollywood tradition”. This season does include an on-set romance with Vinnie Chase and Mandy Moore (as herself). And what the actor gets, the manager gets also, although in this instance the manager gets the more beautiful girl in the form of an off-set romance with Emmanuelle Chriqui. You should see that dress from the back. Wait, what was I saying about water? Oh, right. Adaptation. Well, the entire ensemble manages to get out of this situation by adapting. Basically, Ari leaves the agency to start a new one, and he’s taking the gang with him. Which might just make for a great season 3. Entourage (Season 2). USA. 2005. 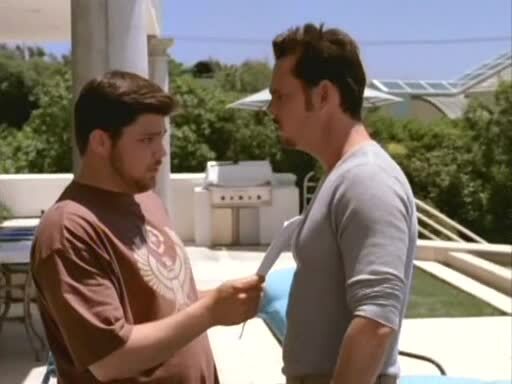 You might also want to check out the reviews of Entourage Season 1, Season 3, and Season 4.